Aric Almirola’s career came full circle in 2018. The driver of the No. 10 Smithfield Ford Mustang embarked on his seventh full season in the Monster Energy NASCAR Cup Series, but first with Stewart-Haas Racing (SHR). In reconnecting with familiar faces, most notably team co-owner Tony Stewart and crew chief John Klausmeier, Almirola had a career year. In a season that began with a near win in the Daytona 500, as Almirola was leading on the final lap before getting spun only a mile from the finish line, Almirola ended 2018 a career-best fifth in the championship standings, 11 places better than his previous best points finish of 16th in 2014. He got there thanks to front-running consistency. Almirola’s 17 top-10 finishes were more than double his tally from any previous season, and his 181 laps led were more than he had in his seven previous seasons combined. Finally, after contending for wins all year long, Almirola finally broke through in the fall with a popular victory Oct. 14 at Talladega (Ala.) Superspeedway that sent him into the penultimate round of the NASCAR Playoffs. A year earlier at his introductory press conference where the No. 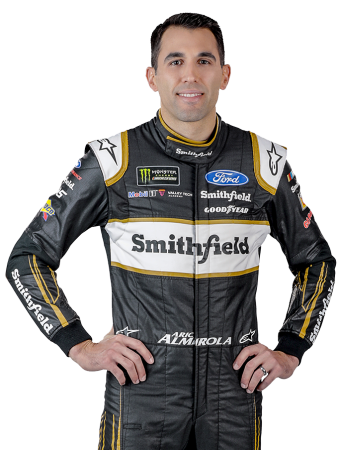 10 Smithfield Ford was unveiled, Almirola spoke prophetically about his own expectations for 2018. Almirola obviously seized his opportunity at SHR, but the talent displayed in 2018 had been seen long ago by Stewart, who was a teammate of Almirola’s at Joe Gibbs Racing (JGR). From 2004 until midway through 2007, Almirola and Stewart spent considerable time together. And when Almirola left JGR to join Dale Earnhardt Inc., he met Klausmeier, an engineer with a Bachelor of Science degree in mechanical engineering from the University of Maryland-Baltimore. His histories with Stewart and Klausmeier made the transition to SHR smooth. Almirola had spent the prior six seasons racing for Richard Petty Motorsports, where he piloted the iconic No. 43 Ford. In his time with Petty, Almirola scored the organization’s first victory in the famed No. 43 since 1999 when he won the July 2014 race Daytona (Fla.) International Speedway. He also won a pole and earned 11 top-fives and 31 top-10s. But peaks of success seemed to come between valleys that were too wide, prompting Almirola to find a new opportunity with SHR. It wasn’t the first time he set out to showcase his ability. A Tampa, Florida, native of Cuban descent, Almirola’s racing career began in go-karts at age 8. After winning many races and local titles in and around his home state, he took his talent to the national karting scene in 1998. He quickly made his presence known, qualifying on the pole for the World Karting Association Grand Nationals at Daytona Beach Municipal Stadium before finishing fourth in the season-ending point standings. At 16, Almirola graduated to open-wheel Modifieds – 2,750-pound racecars that put out more than 700 horsepower. In 2000, he won the rookie of the year title in two separate Modified divisions – Florida Modified and Southern Automobile Racing Association Modified – while garnering his first career win in the Joslin Memorial 100 at Orlando (Fla.) Speedworld, beating the top drivers in Florida. In March 2002, Almirola advanced from open-wheel Modifieds to the Sunbelt Super Late Model Division, where he finished runner-up in the rookie of year standings. He continued in that division in 2003, winning three poles at USA Speedway in Lakeland, Florida, two poles at New Smyrna (Fla.) Speedway, and one pole at Bronson (Fla.) Speedway. Almirola’s big break came in the fall of 2003. In conjunction with the late Reggie White, a Hall of Fame defensive end who played in the National Football League, the Gibbs organization formed a diversity program to create a grassroots stock car team that would identify and assist minorities with the desire and talent to pursue a career in motorsports. Almirola was selected to join the program after participating in a driver combine at Hickory (N.C.) Motor Speedway. He began his career at Gibbs in 2004 driving a Late Model in the NASCAR Whelen All-American Series at the .4-mile Ace Speedway in Altamahaw, North Carolina. After scoring two wins, six top-fives and 15 top-10s, Almirola traversed the Southeast competing in regional Late Model races. By the end of 2005, Almirola was running a limited schedule in the NASCAR Truck Series, which led to a full-time Truck Series ride and a nine-race NASCAR Xfinity Series schedule in 2006. Almirola continued to hone his craft as he moved into 2007. He made his first career NASCAR Cup Series start March 11 at Las Vegas Motor Speedway, three days shy of his 23rd birthday. He competed in 18 Xfinity Series events for Gibbs, scoring two top-fives, six top-10s and three poles. He was also credited with his first series victory June 23, when he co-drove the No. 20 entry with Denny Hamlin to victory at The Milwaukee Mile. Hamlin was commuting from the NASCAR Cup Series event at Sonoma (Calif.) Raceway and arrived in Milwaukee late. Almirola won the pole, started the race and promptly led the first 43 laps before Hamlin finally arrived and replaced Almirola for the duration of the race. By August of 2007, Almirola was running more NASCAR Cup Series races, sharing the Earnhardt team’s No. 01 entry with NASCAR Hall of Famer Mark Martin. After wheeling the No. 01 car for five races in 2007, Almirola competed in 12 NASCAR Cup Series races in 2008, again splitting time with Martin while earning a best finish of eighth on March 16 at Bristol (Tenn.) Motor Speedway in just his seventh career Cup Series start. Almirola also made his first and only career start in the NASCAR K&N Pro Series East, winning the Sept. 19 race at Dover (Del.) International Speedway. The 2009 season saw Almirola compete on a part-time basis across NASCAR’s top three national touring divisions, making eight Cup Series starts, four Xfinity Series starts and 16 Truck Series starts. In the Truck Series, Almirola scored seven top-fives and 10 top-10s while leading 98 laps. Those collective performances led Almirola to a full-time Truck Series drive in 2010 with Billy Ballew Motorsports. It was a standout season with Almirola winning two races – May 14 at Dover and June 12 at Michigan International Speedway in Brooklyn – while racking up 11 top-fives and 21 top-10s as he competed for the series championship in which he ultimately finished second. In addition to his Truck Series efforts, Almirola competed in a limited number of NASCAR Cup Series and Xfinity Series races. He drove in eight Xfinity Series races for JR Motorsports, earning a top-five and four top-10s to earn a full-time ride with the team in 2011. Almirola grabbed a pole and secured seven top-fives and 18 top-10s to finish fourth in the 2011 Xfinity Series standings. He was set to stay at JR Motorsports for the 2012 season, but a fateful call from “The King” took Almirola in a different direction. NASCAR Hall of Famer and seven-time NASCAR Cup Series champion Richard Petty tabbed Almirola to drive his No. 43 Ford in 2012. It was Almirola’s first full season in the NASCAR Cup Series, and he rewarded Petty’s belief in him by winning the pole for the Coca-Cola 600 in May at Charlotte (N.C.) Motor Speedway and finishing the year with a top-five and four top-10s. Almirola’s learning curve in the NASCAR Cup Series continued in 2013. He picked up a top-five and six top-10s, setting him up for a breakthrough year in 2014 when he won his first career NASCAR Cup Series race. That coveted win came on July 6 at Daytona, and it advanced Almirola into the NASCAR Playoffs for the first time. He ended the year 16th in the championship with two top-fives and seven top-10s. From 2015 through 2017, Almirola collected six top-fives and 13 top-10s for Petty. While a variety of factors made the success of 2014 difficult to emulate, Almirola made sure his abilities remained on display by winning two Xfinity Series races – one at Daytona in 2016 and another at Talladega in 2017. The weekend after winning that Xfinity Series race at Talladega, Almirola was involved in a violent, multicar accident May 13 at Kansas Speedway in Kansas City. Injuries sustained in the accident sidelined Almirola for seven races, but he returned stronger than ever, earning three top-10s to complete the season and position him for the opportunity with SHR. Almirola resides in Mooresville, North Carolina, with his wife Janice and two children – Alex and Abby.